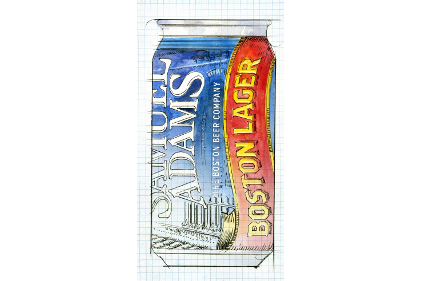 Samuel Adams, long a pioneer in the craft beer world, recently announced that they are finally going to offer their beer in cans, starting early this summer with Boston Lager and Alpine Spring Summer Ale (oops! I had this wrong in the original post). Several excellent craft breweries have been producing exceptional canned beers for years, so it begs the question – why did it take Sam Adams so long? Jenn Abelson of the Boston Globe does a wonderful job of chronicling the long and tedious process, one in which Jim Koch and company rejected conventional cans and forged their own path. They considered unique shapes, a can with a completely open top, one with two holes so you could smell the beer, and countless vessels topped with odd-shaped openings to address the main issue of drinking from cans – you can’t smell the beer. In the end, the design isn’t that different from conventional cans, with the exception of a slightly wider mouth opening and a broader concave curve where the bottom lip meets the edge of the can. The combination gives the can a unique hourglass shape at the top, and will probably make drinking from the can more ergonomically satisfying, but what will it do for the flavor of the brew? A taste will tell if it as worth the long wait, but for a brewer this large to wait this long to can their beers, I say it had better be very special indeed. Right now, I use a plastic cup with me when I drink canned beer in places where glass isn’t allowed, as drinking from the can robs me of a big part of the sensory experience, the beer’s aroma. If this can solves that problem (or simply makes drinking from the can better than bad) then I guess it was worth the delay. If it’s the same experience, just with a different shape, I feel sorry that Sam Adams missed out on two years of canned beer sales, which probably is not an insignificant amount of duckets. It looks like we won’t have to wait much longer to experience the difference for ourselves. Plastic? What are you doing at college parties? Ha ha – no, I use a sturdy cup we got from the Milwaukee Zoo that has nicely curved sides. If they do hit their target and deliver a more satisfying craft beer experience I’ll be happy, though not overly so unless some of the other current craft canners follow suit and redesign their cans accordingly. I’m very skeptical about the width of the rim contributing anything to more aroma. My bet is that whatever other ideas they came up with, namely a bigger opening, turned out to be cost prohibitive. They want to enter the can market so badly that they picked a design that was different, but not too costly, just to set themselves apart and justify Koch’s earlier concerns. I’ll just wait and see like everyone else. Too bad they’re not starting out with the ale first rather than the lager, I’ve never really been a fan of the lager. I think you nailed it – its a compromise. They ran out of the and didn’t want to miss another summer noodling around with designs that weren’t economically feasible. Duh – It’s Summer Ale, not Alpine Spring that’s coming out in cans alongside Boston Lager! I just fixed the original post. I have to give Jim kock credit, he is always trying to innovate on the craft beer drinking experience. I kind of wish I liked more of his beers. I’m not saying it will make a big difference, but I applaud the effort to ask “is there a better way to do this?”. It’s easy to do what everyone else is doing. I love cans for their utility and some of the best beers I’ve had have come from cans. I hope it nudges the form forward. I’d love to drink out of a can, but it buries the aroma so much that the beer doesn’t taste as wonderful as it is. If they can help change this, I totally applaud the effort. One design they tried was a wide open top, akin to a mason jar. Everyone freaked out about spilling and bugs getting in, which is too bad – I think that idea has merit. I very much appreciate what he’s done and the value his beers represent. Every once in awhile I’ll have a fling with one of his brews. Last time it was Cherry Wheat, and lately I’ve had a hankering for Alpine Spring. I feel the same way. He deserves a ton of respect for innovation (that nifty SA Lager Glass comes to mind in relation to the “new” can design) and for supporting independent craft brewers in the face of Big Beer. I also like what he did with resurrecting New Albion Ale – hence my blog post). That said, there are only a small handful of SA brews that I truly enjoy and I rarely seek them out. I just don’t get the advantage of the can for the consumer. Where the same brand of beer is available in cans and bottles, the price for a six-pack tends to be identical. I do understand the advantages of removing a labeling line and the extra storage available in the cold room with cases of cans, and the weight savings for shipping, but don’t know why anyone would choose a can over a bottle with the same price point. I will confess some snobbery on my part since the best beers I’ve consumed have always been in bottles. That plus I’ve got the Pavlovian experience of using my special bottle opener, stored in a back-lit case, which no one is allowed to look at directly (except other beer connoisseurs), to pry the crown off the bottle. Am I to simply forego that ceremony in favor of using a pry tab on a can? It’s a slippery slope when decorum and protocol begin to fade. Where will it stop? Boxed beer? 2 liter plastic? Bucket and dipper perhaps? I’m afraid. Ecological reasons. Backpacking. Shotgunning. Chilling. Biking. I like the box of beer idea for many of these reasons, just on a grander scale. You can’t take glass into my lake, so good beers in cans is a godsend! Bucket and dipper is a better alternative than drinking straight from the can, as long as you drink it fast enough. At least the b&d approach allows for the aroma to be enjoyed. Mmmm…some of them were, others were ceramic vessels. A buddy of man has his granddad’s growler from turn-of-the century Trenton. Its very ornate, with his name spelled out in a Gothic style of font. That should say mine not “man”. Well the proof is in the pudding as they say. We’ll just have to wait and see how it tastes. Cans are this year’s beer trend… as much or more than barrel-aging has been in recent years… and skyrocketing ABV before that. I don’t think craft beer in cans is a trend anymore than beer from a bottle was back in the 17th century when they finally made glass that could stand up to CO2. I simply think we’ve hit the point where technology, affordability and consumer acceptance have all finally come together. 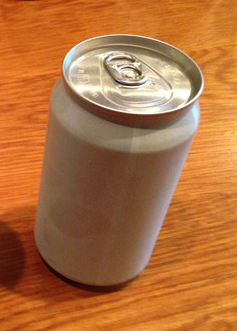 Cans are the best consumer-focused packaging for the beer. I like to call them “mini-kegs.” They allow zero oxygen and light to reach the beer, they are more efficient to recycle, can be taken to more places (ball parks, beaches, pools, Jim’s lake, etc.) and are significantly lighter so transportation costs are lower. This all being said, I am with you 100% on drinking from a can. I won’t do it unless I absolutely can’t get a glass. I miss the aroma and don’t like thinking about what might have crawled across the top of the can before I open it. The new “can carriers” that completely cover the can and or slowly replacing the old “dog bra” rings are helping there though they are still substantially more expensive for the brewery. I also like the little box approach used by breweries like 21st Amendment. In both cases I make sure to recycle both the carriers and the cardboard. Craft beer in cans is only going to become more common … and I think that is a good thing for is beer drinkers. I agree with everything you say, David, except your first statement – craft beer in cans is a trend,because it’s an idea that’s gaining momentum. But that little semantical point aside, you’re spot on! And you know what they say about “assume” …. Jim, Are you sure that they will be putting Alpine Spring in cans? I was not able to confirm that anywhere. It appears they will be canning the Lager and Summer Ale only. Yikes – you’re right! I have Alpine Spring on the brain. Excuse me while I rewrite history (or at least THIStory). Have you already forgotten your Heady Topper post? I hate those little plastic cups or bigger plastic steins they use at various kinds of tasting events. I tried bringing my own stein to a Brewfest once–they were very unhappy w/ me. But, like Martin, if given the opportunity, I always decant my beer into glass–its just an all-around better experience. I used to love this blog. No Don in a while .. No comment on Makers watering down then reversing decision? Don’t been busy working on opening a beer oasis in Nampa, Idaho and hasn’t had access to a computer as he slaves away renovating the space he’s rented. I’m hoping he’ll be back with us soon, bug it’s already been too long. I almost wrote a piece about Makers, and how their “we don’t listen to anybody, we don’t follow trends,” ad campaigns have proven completely false, but I’ve been struggling to find the time to write about beer, so I let it go. But I’m with you. Big news in the whiskey world and no POV from Don. It’s a bummer.